While just the thought of root canal therapy is enough to make some people nervous, the reality of this routine treatment is quite different from what you may have heard. In fact, root canal treatment doesn’t cause pain: it relieves it. The procedure itself is not unlike having a cavity filled, though it takes some more time. Root canals are the small, cave-like passages deep inside the hard outer layers of your teeth. These canals, which may be straight or branched, contain blood vessels, nerves and connective tissue — the “pulp” of the tooth. These tissues aid in the tooth’s growth, but aren’t needed once teeth are fully developed. Sometimes, the pulp tissue becomes infected with harmful bacteria — due to a fracture in the tooth, untreated tooth decay, or another cause. As bacteria multiply, the infected tissue becomes inflamed and begins to die. Pain, sensitivity to heat or cold, swelling or tenderness of the nearby gum tissues, and discoloration of the tooth are possible symptoms of an infection in the tooth’s pulp. It’s also possible to have milder symptoms, or none at all. Sometimes a root canal problem may be discovered during a routine dental exam. 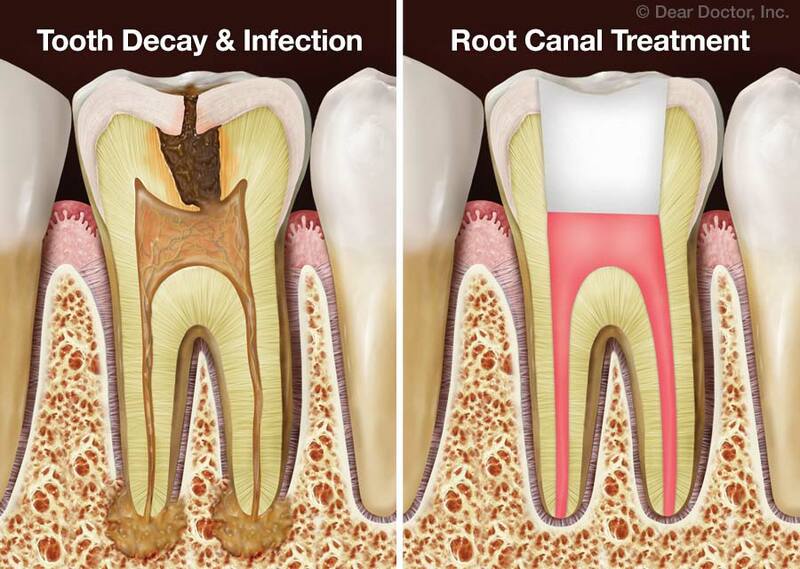 An infection in the tooth’s pulp means you need a procedure that is also referred to as a “root canal” — that is, a procedure designed to remove dead and dying tissue and prevent re-infection. The next step is similar to the procedure for filling a cavity. A small hole will be drilled in the surface of your tooth, providing access to the canals. A series of tiny instruments is used to remove the dead and dying tissue from the main canal and any side branches. Then, the inner spaces are cleaned and disinfected, and filled with a sterile bio-compatible material. Finally, the access hole in the tooth is sealed up. After the procedure, you may be advised to eat a soft diet for a day or so afterward, and to take over-the-counter pain relievers, such as ibuprofen, for any minor discomfort you may experience. A tooth that has had a root canal will usually need to have a permanent restoration, such as a crown (cap), to bring back its full function. This usually takes place at a separate appointment. But when it’s done, the restored tooth will be free of infection and pain — and the root-canal-treated tooth can last just as long as any of your natural teeth. What happens if you don’t get a needed root canal? If you are able to ignore any uncomfortable symptoms, they may go away in time… but the infection won’t. It can spread into the surrounding bone, and may reappear in the form of a painful abscess, or a discharge of pus into the mouth. If left untreated, the bacterial infection can eventually destroy tissue and bone, and even result in tooth loss. So if you’re told you need a root canal, don’t wait: The sooner you remove the infection and restore the tooth, the better you’ll feel… and the healthier your mouth will be. Over 15 million root canal procedures are performed in the U.S. each year — and now you can see why there’s no need to fear this routine and effective treatment.